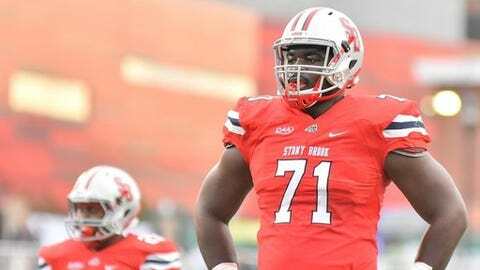 (STATS) – Stony Brook has lost All-America left tackle Timon Parris for the remainder of the season after the senior suffered a fractured fibula during the team’s win at Richmond last weekend. Parris has been projected to become Stony Brook’s first-ever NFL draft choice next spring, although the injury may set back that possibility. Small school draft evaluator Josh Buchanan projected Parris for the fifth round last week. The 6-foot-5, 320-pound Parris had started all 41 games of his career. He was named to the STATS FCS All-America second team after his junior season and was on the preseason first team this year. Jonathan Haynes, a redshirt junior who spent two seasons at West Virginia, is expected to start at left tackle when Stony Brook hosts Albany on Saturday. The 14th-ranked Seawolves are 6-2 overall and 5-1 in CAA Football behind James Madison and Elon.